Well, we did it folks – today is the last day of 10 Days of Vegan Stampede. 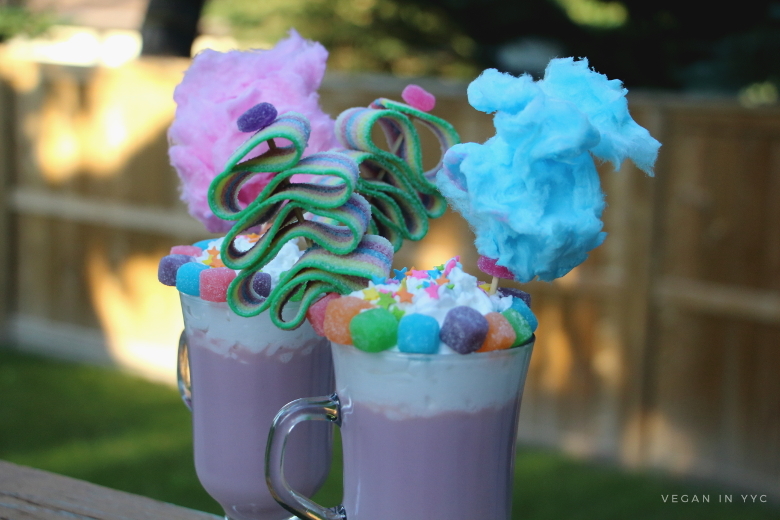 To cap it off, we’re going to finish with a recipe I know you’ve been dying to get your hands on – the Unicorn White Hot Chocolate. Finally, I must confess that this is incredibly tasty with a shot or two of vegan Bailey’s, but this is entirely optional, and I definitely think you should skip this step if you’re planning on serving this to children. 😉 But if you’re making this for your (adult) self or some friends, a shot or two is a welcome addition to the hot chocolate. In a sauce pan on the lowest heat possible, melt the cocoa butter. Add the vanilla, and the soymilk, and whisk together; initially the cocoa butter will sit on top - this is fine, just continue to whisk until they are combined. Add the beet juice (optional). Split the hot chocolate between 2 mugs. Add 1oz Baileys Almande to each (optional). Top with coconut whipped cream, and garnish with candies of choice. 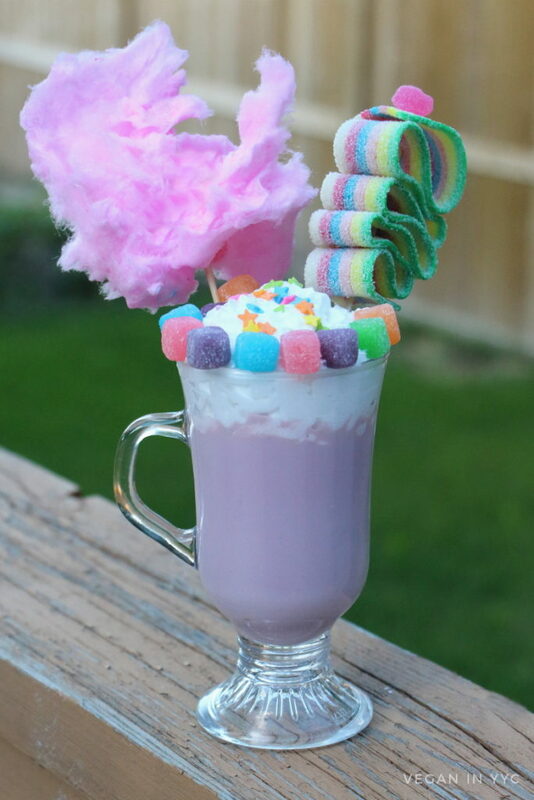 I used the following candy to decorate my hot chocolates: Sour Belts, Cotton Candy, Tropical Jelly Dots, Warheads Sour Chews and Star Quins. The cotton candy and Sour Belts are arranged on bamboo sticks, using the Tropical Jelly Dots to secure them in place. 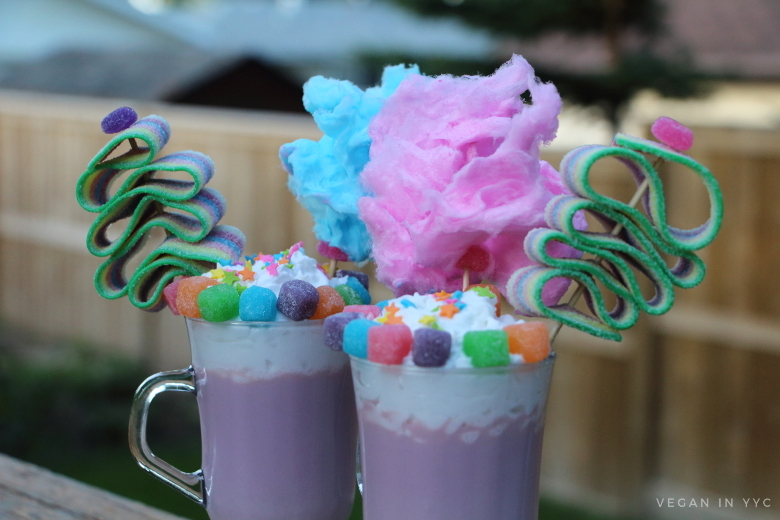 Warheads Sour Chews line the rim of the mug, with coconut whipped cream to keep them steady.